The other day Ber said she did ‘only 8 rows.’ I calculated that out and the number of stitches that equalled out to was almost 3 times the entire work I’ve done on my sock. Dang, she’s fast. We are in the home stretch for the arrival of the little one. It can literally be any day now. 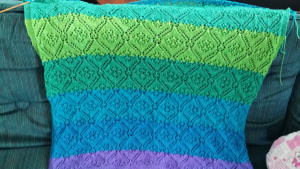 I’m also nearing the completion of the baby blanket. Just a couple more color changes. I feel like now its just a battle of the wills. Who will be victorious?